Micro Air® dust collectors utilize cartridge filtration and are available in a large range of configurations up to 32 cartridge models. Modular design provides ability to bank units together for virtually an unlimited number of cartridges. All are designed to meet OSHA / NFPA and Industrial Ventilation Standards and are sized and rated for the proper air-to-cloth ratio to solve clean air issues in a wide variety of applications such as weld smoke, powder dust, sanding dust, shot-blast dust, grinding dust, paper dust, etc. RP12-5 ducted to fifteen robotic weld cells in an automotive parts facility. Key to our models is a revolutionary new cleaning system called Roto-Pulse®. This is an on line system that continually cleans the filters with a revolving, compressed air driven, tube. As air enters the tube, the force of the pulse causes the tube to rotate incrementally inside the cartridge. While rotating, air exits the pre-drilled holes in the tube. The result is that air hits the entire inside length of the cartridge, pulsing dirt particles away from the filter for a much more efficient cleaning cycle. Provides a much more efficient cleaning cycle for increased air flow and longer cartridge life. Dirty air always flows across the filters from top to bottom utilizing the natural downward force of gravity to get the particles to the filtration. A small footprint of only 42″ x 48″ allows Micro Air® dust collectors to be located in virtually any area. All electrical and air connections are outside the cabinet for easy installation and maintenance. Micro Air® provides an after-pulse cleaning cycle in addition to automatic on-line cleaning. This allows the unit to pulse the cartridges after power is shut off for an effective cleaning at the end of a shift. We can design and provide a complete dust control system including the collector and the ductwork to solve your particular problem. This is your assurance of the best possible total system supplied from a single source. 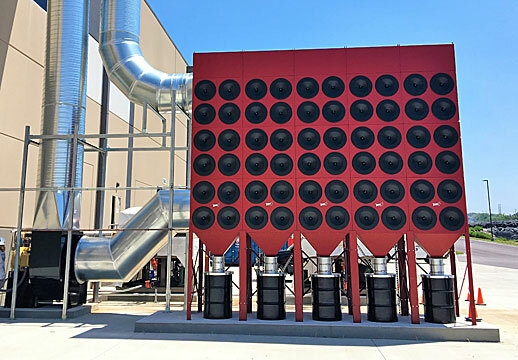 In addition to our standard features, the model RP dust collectors have a broad range of options including explosion vents, backblast dampers, HEPA after-filters, spark arrestors, Intelli-Touch energy savings controls, low profile options, a variety of different cartridges, and weather proof kits. All Micro Air® dust collectors are sold and serviced by a national network of factory trained Engineered Systems Distributors. In addition, our direct factory support includes design consultation, CAD drawings and technical support, all at no charge to the end user.